Learn more about the characteristics of bezel setting. Learn more about the characteristics of channel setting. A pav? setting looks like a continuous surface of diamonds, but is actually made up of small diamonds set side by side into little holes, their surfaces nearly level with the setting. Each tiny diamond, weighing just a few points, is fully cut with 58 facets. 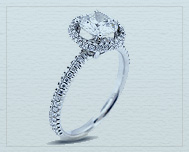 Though small in size, each stone contributes to the overall, shimmering look of the design. After it is positioned in its hole, tiny bits of metal from the surface of the shank are pushed over the edge of the diamond, forming tiny beads to hold the stone in place. Micro Pav? is the highly precise setting of very small diamonds using a microscope. 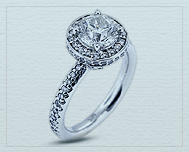 The small diamonds used in this type of setting are even smaller than the ones used in pav? setting. Because it is harder to cut and set these small diamonds, micro pav? settings tend to run more expensive than pav? settings.